A special event is coming up here at the end of the summer so mark your calendars. Minnesota Audubon is hosting the first ever state-wide Chimney Swift Sit in Minnesota. They plan to make this an annual event so this is your chance to get in on the first event in what will hopefully be a fun new tradition. This state-wide event will be held at dusk on August 7-9 and September 11-13. The idea is to count chimney swifts as they enter their roosting site for the evening. According to sit coordinator Ron Windingstad, "The Sit requires spending about one hour at dusk during the periods August 7-9 and September 11-13, 2009 counting swifts as they enter a nighttime roosting place. Volunteers can count on one night or on several nights during the designated period." The purpose of the Chimney Swift Sit is to gain a better understanding of Chimney Swift distribution and population numbers in the state and also to help preserve structures where they nest. As a special bonus, everyone who enters a report is entered into a drawing for a prize! This event is part of the National Swift Night Out organized by the Driftwood Wildlife Association. These are the same people who bring us those awesome Chimney Swift migration maps each spring. Audubon is asking for help in two ways. First off, volunteer to be a counter! Second, even if you can't partake in the actual counting for this citizen science project you can help out by letting Audubon know about roosting sites so they can send another volunteer to count. If you know of roosting sites you can contact Ron Windingstad at rwindingstad@audubon.org. 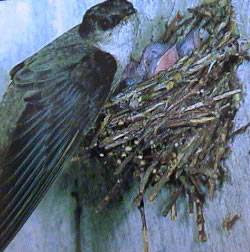 To find out more about the Sit and to download the necessary forms, check out the Chimney Swift Sit page at Minnesota Audubon.